"Leigh, the service we received from Kanikani Kids was excellent. The uniforms you designed and made for us represent our school perfectly. Thanks so much for how hard you worked with us to design and make something we truly love. Our Kapahaka uniforms were a major investment for our school and will need to last for decades. I am confident that what you delivered us will. The quality is exceptional. I have absolutely no hesitation in recommending Kanikani Kids as the place to go to if schools need kappa haka uniforms as they far exceeded our expectations." Principal Kahurangi School, Wellington. West End School's Kapa Haka Whanau would like to acknowledge the professionalism and the support received from the Whanau of Kanikani Kids in the making and the desinging of our Kapa Haka uniforms. One of our many highlights recently was that our Roopu won First Place for The Best Dressed Roopu at the Kowhiri Tika Mai Competitions 2011. 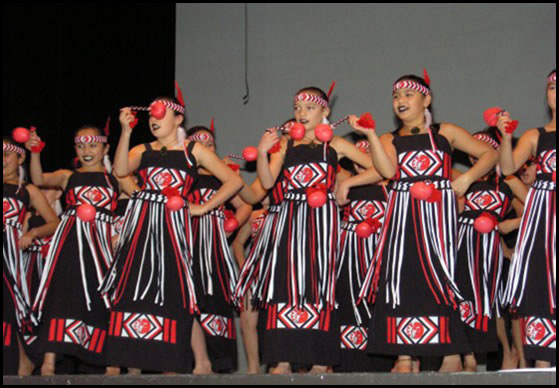 Of late, our Kapa Haka Roopu has been invited to attend and perform at the Te Mana Kuratahi National Kapa Haka-a-Motu 2011 being held in Whangarei. We will wear our Kapa Haka uniform with pride, respect and the integrity it deserves. Thanks to Whaea Leigh Rau and the Whanau of Kanikani Kids.